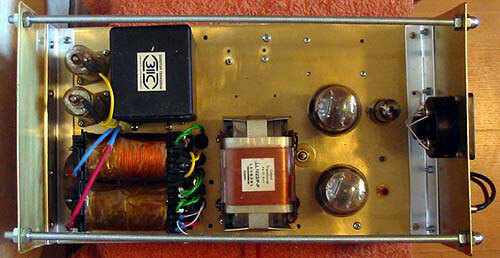 The amp is based on Ralph Power's simple IT-coupled PP amp. However, being a Fixed Bias Believer, I converted both stages to fixed bias. Output stage uses a conventional power supply for biasing; first stage, 6C45P into LL1160 (Alt-U wiring), is biased with an inline lithium button cell to 220..250V, 25..30mA. This is probably unsafe. 6C45P usually requires a low resistance grid-to-ground path (150K or less by the book) for stability. Here, it's up to 300K plus battery. As if it's not enough, Ua is 100V above rated maximum and Pa is close to maximum. So far, it's stable. I also considered using gas regulators on the first stage, but eventually discarded the idea. First problem: fixed bias and fixed plate voltage don't necessarily result in optimal current. 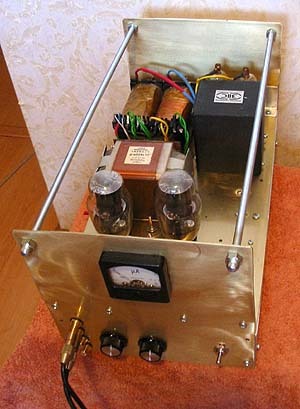 Second: traditional Russian gas regulators are rated for 5-30 mA current. That is, idle current through regulator must be set at around 20mA, allowing 10..15mA AC current swing (plus and minus). If the current through 6C45P exceeds idle plus 15mA, which is quite possible at low frequencies and high input level - regulator shuts down, and this is something I don't want to hear.